Today, the 4th of May, 2017, the capital, Aden, is hosting the largest public rally in the political history of the south. These crowds are an extension of the peaceful struggle of the South Hirak Movement and its valiant resistance, and they came today to express the will of the people of the south. This is the will of the people all over the south, and they have been struggling for many years and have given many sacrifices, including many people martyred, injured, or detained, in order to restore the southern state. The issue of the people of South Arabia is a just one, one that has legal and political legitimacy and is recognized by Arab nations, the international community, and the regional community. In light of the dangers that face the Southern Issue, and the people of the south sensing these dangers, the latest of which was the conspiracy on April 27th, 2017, which came on the anniversary of the announcement of the war against the south in 1994. This conspiracy included those dangerous and provocative decrees that represent the aggression of the partners of the invasion of the South in the summer of 1994, and it did not just target the most prominent symbols of the Southern Issue, its valiant resistance, and the heroes of Decisive Storm and Restoring Hope and the fight against terrorism; it targeted the essence of the Southern Issue. Operations Decisive Storm and Restoring Hope have created a new turning point in the history of the region, and they have also created a positive reality on the ground in the south as a result of effective participation of the Southern Resistance, and all of its components, to achieve the great victory in liberating the areas of the south with the support of the countries of the Arab Coalition. They were able to confront and expel the invasion of the Houthi and Saleh militias, but these victories did not lead to the Southern Resistance being an effective partner in the political process. On the contrary, the Southern Resistance was marginalized, excluded, and conspired against, while its role was shunned. These victories in the South were invested by the political terrorist forces that are in control of the decision-making authority and in opposition to the aspirations of the people of the South. The situation reached the point where political punishment was imposed and investigations carried out against the most prominent figures in the Resistance. This was an assault on the political partnership of the people of the South with the Legitimacy, which had been hijacked by the Muslim Brotherhood, and things did not stop there. Things reached the highest points of social oppression and collective punishment for the popular support of the Resistance in the South, a systematic collective punishment, and this continued with a war on services in the south. 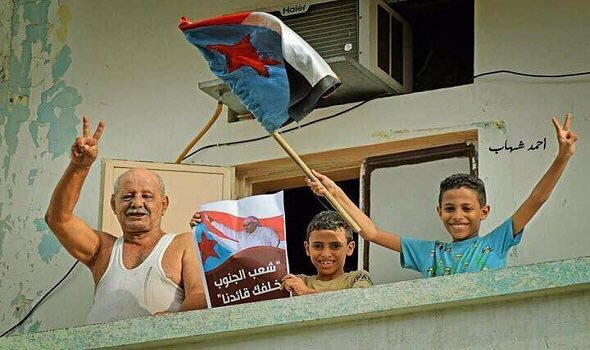 The living standards and services deteriorated, and salaries were not paid, especially in Aden, the capital of the South. This is a city that has made a lot of sacrifices and whose people valiantly and courageously fought alongside Operation Decisive Storm and forced the invaders out of Aden. This city has not seen, in all of its history, such a deterioration in services and collective punishment, and the electricity, water, salaries, and civilian life as a whole deteriorated to unprecedented levels, while the rehabilitation of government institutions were hindered, including the rehabilitation of the judiciary. This war used services as an immoral means of hindering and thwarting the leaders of the Southern Resistance, who had borne upon themselves the responsibility of managing the liberated areas and combating terrorism in them. From here, from the city of Aden, the will of the people of the South, which is the only true legitimacy, has come up to express its rejection of these decrees and any similar decrees in the future, and to express its position and desire to exercise its legal right in protecting the Southern Issue and safeguarding its path, especially with the availability of subjective and objective factors during this historic moment that must be benefitted from. This great mass of people has come to preserve the Southern victory, maximize it, and build on it the aspirations of the people of the South. We also want to take this occasion to salute the people of Hadramawt on the success of the Inclusive Hadramawt Conference. They are a people that are considered an integral part of the national Southern Movement and the carrier of the torch of its civilization. This declaration is to be called the Aden Historic Declaration, and it gets its legal authority from the will of the people of the South. Commander Aidarous Qassim Al Zubaidi is authorized to announce a national political leadership (under his leadership) to manage and represent the South, and this leadership is responsible for representing and leading the South to achieve its goals and aspirations. Commander Aidarous Qassim Al Zubaidi is given full authority to take whatever steps necessary to implement the articles of this declaration. The millions of Southerners marching reiterate that the South, as a nation and an identity, now and in the future, is for all Southerners by all Southerners. The South after May 4th, 2017, is not like the South before that date, and is based on Southern national partnership and consensus. The realities on the ground have proven the strength of the partnership between the Southern Resistance, the Southern Movement, and the Arab Coalition Forces, led by the Kingdom of Saudi Arabia and the United Arab Emirates. This is a partnership sealed in blood and continuing sacrifice. This strategic partnership aims to achieve the mutual goals of the Arab Coalition against the dangers of Iranian expansion, counterterrorism, and ensuring the security and stability of the area, as well as the people of the South regaining their sovereignty over their territory. This last point is a decisive part of the security of the region. The millions that have come out also reiterate, to the international community, the Arab countries, and the whole world, as well as to all humanitarian and human rights organizations, that it is completely committed to international law, the United Nations Charter, and the Universal Declaration of Human Rights. At the same time, these masses renew appeal to the international community to provide aid to the people of the South and alleviate their suffering by achieving their legal and legitimate aspirations. And freedom for the detainees.